Ontarians are reminded to protect themselves from tick bites while enjoying or working outdoors this summer. The most common Lyme disease telltale sign is a rash. This easily identifiable rash begins to form a “bull’s eye shape”, or look like a target.It can begin to form anywhere from 3-30 days after the initial tick bite. Most patients report their rashes showing up after one week of noticing the insect bite. Symptoms of Lyme disease can be different from person to person. You may not have any symptoms at all, while others may suffer severe symptoms. 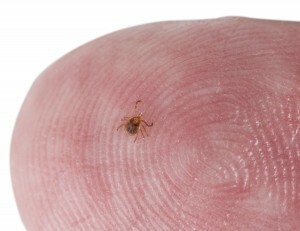 Sometimes, you may not experience symptoms for weeks after you are bitten by an infected tick. If left untreated, Lyme disease symptoms can last from months to years. In rare cases, Lyme disease can lead to death. See your health provider right away if you develop symptoms of Lyme disease in the weeks after a tick bite. Tell them about your symptoms and if you participated in any activities in an at-risk area. The sooner you get treatment, the better your chance of recovery.